Out of the fire, and felt like I was in a frying pan. After dragging myself out of bed, I immediately got changed into my running kit; trusty Hotpants with a nice sleevelss top. I’ve found that when I’m already changed into my workout stuff, I can’t justify getting back into bed as much. Had my playlist pre made too, so that I couldn’t use that as an excuse. Lovely day for a run anyhow, so after finally getting out of the house (the finding some headphones process took 10 minutes) I was ready to go. There’s an entrance to a local park not half a mile from my house (makes me feel all the more guilty for only starting today) so I did a loop of the park, occasionally putting a burst of speed on to impress people out walking their dogs. Did a good 2.5 miles, which may not seem very far but I am a bit of a couch potato, at a 10 minute mile pace. I could practically hear the Hotpants burning off that fat. There was continual surprise that no one mistook me for a barbeque as I ran around. I myself could hear sizzling. Was bright red by the time I returned to my humble abode and after scrabbling for a glass of water and leaving my Hotpants on till my temp went down (don’t whip them off immediately, if you’re still sweating, they’re still burning calories) and took a well deserved shower! Get hot, get slim, go RUNNING – with HotPants! It’s a new dawn, it’s a new day, it’s a new life… well not quite, but it certainly is the first two. 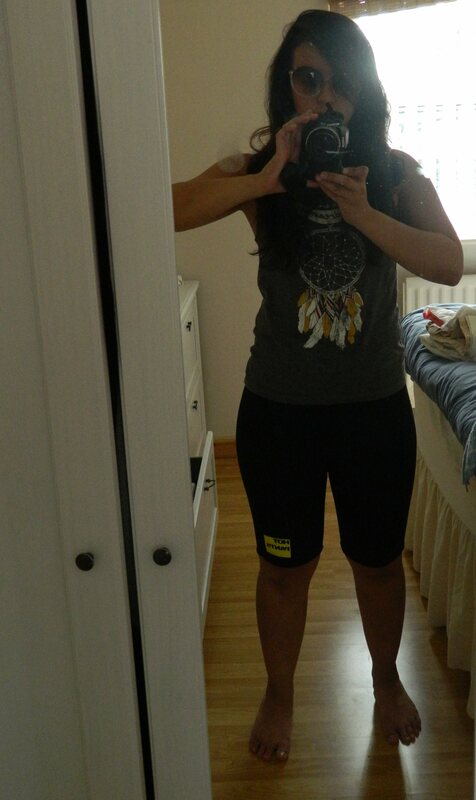 Today is the day I start training for a half marathon – in my Zaggora Hotpants! As women we all have our trouble spots. Mine is, and always has been, my legs. When I went to the gym, my legs kept getting bigger! I am one of those unfortunate people whose leg musle explodes when they exercise. My legs were at one point 25 inches thick! I was disproportionate in the extreme, size 8 tops, size 10-12 pants. Okay, size 12 pants ;). I’ve been looking for solutions since. And no matter what research I do, or how hard I look, there is only one solution to my problem. Running. Running makes you skinny. Absolutely gutted, because it’s neither something I like, nor my forte. Hotpants make you skinny too. It’s already been scientifically proven. They specifically target the area where I’ve always had trouble; what more could I ask for! So I’ve combined the two, and I’ll see where it takes me. Measurements so far – eek!